We love contrasts. That’s why we want to show you how to create beautiful contrasts in your kitchen. 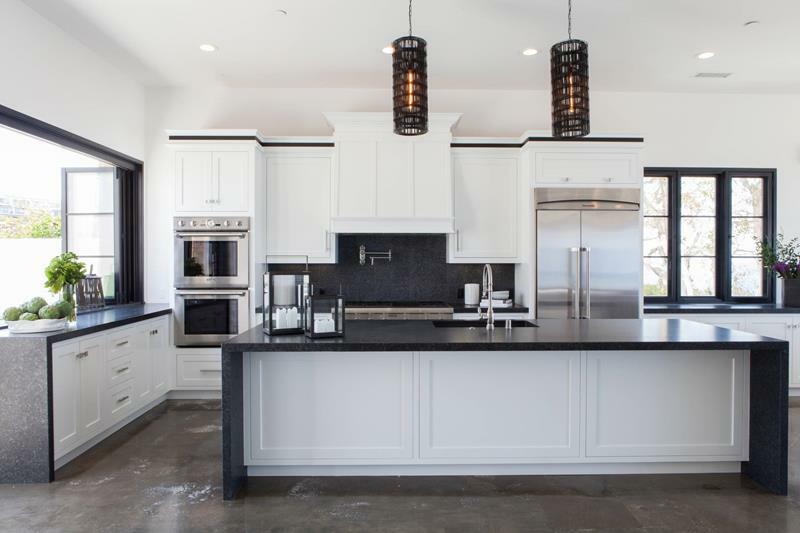 Below, we have gathered over 30 kitchen that use lighter cabinets and match them with darker countertops. From traditional to contemporary, the designs you will see below show such a wide range of possibilities. If you are going for a bold look in your kitchen, look no further. We are sure that you will see something you like below. 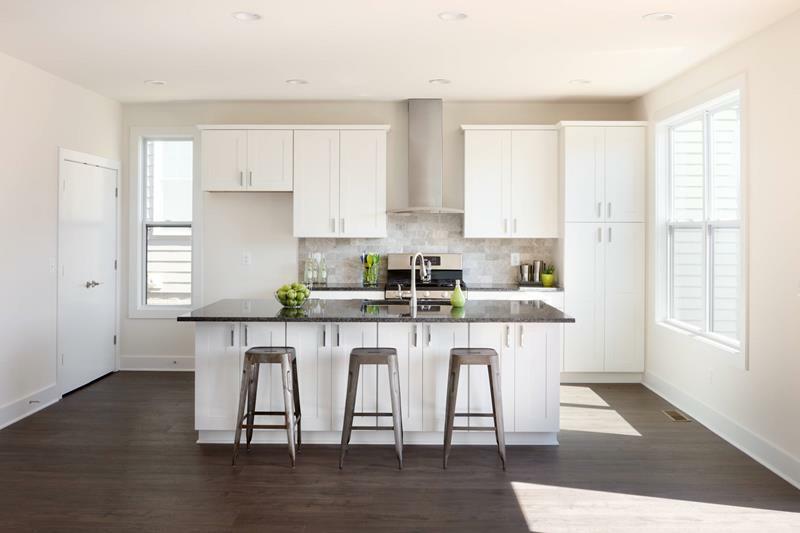 With a large and spacious floor plan, you can appreciate how the natural light shows off the contrasts in this kitchen. 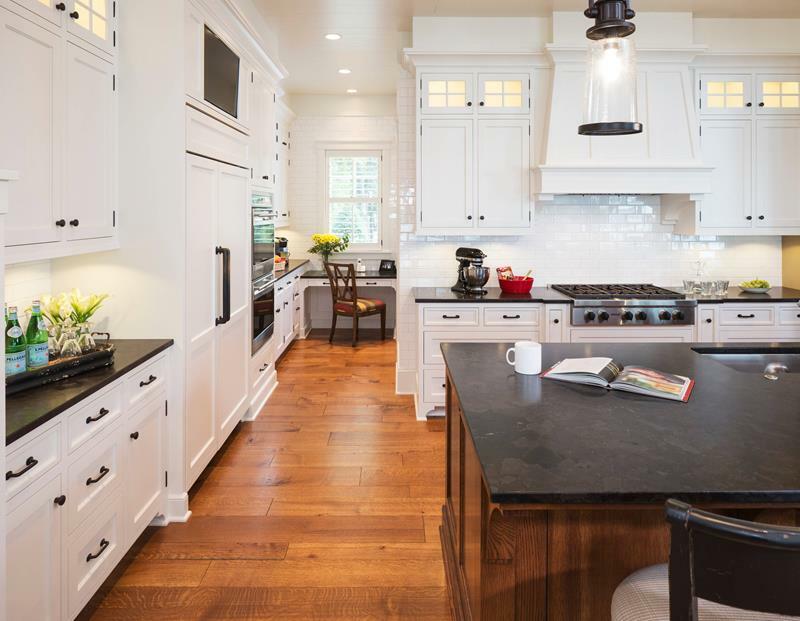 The stone style floor in this kitchen really works well with the light cabinets and darker countertops. 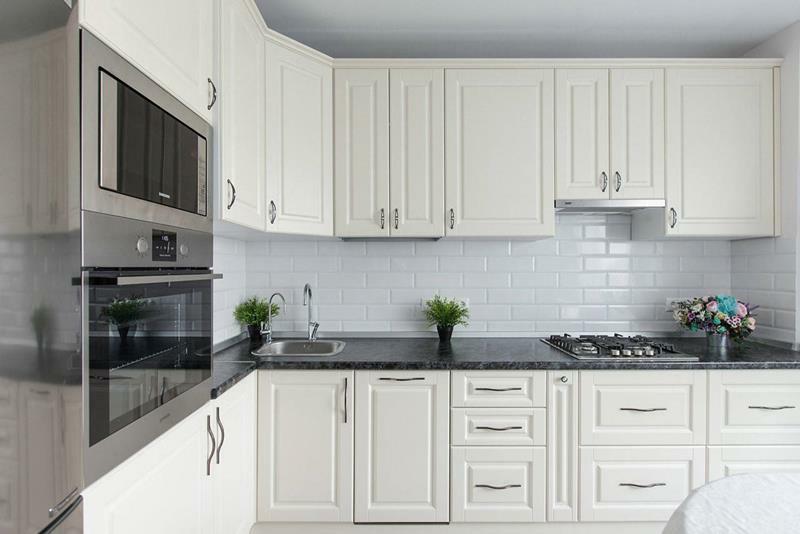 These countertops are a light beige color and they blend perfectly with the bold darker counters. With plenty of room to work, this is a great space. When you have bold hardwood floors and overhead beams, you can really appreciate the contrasts on display in this room. 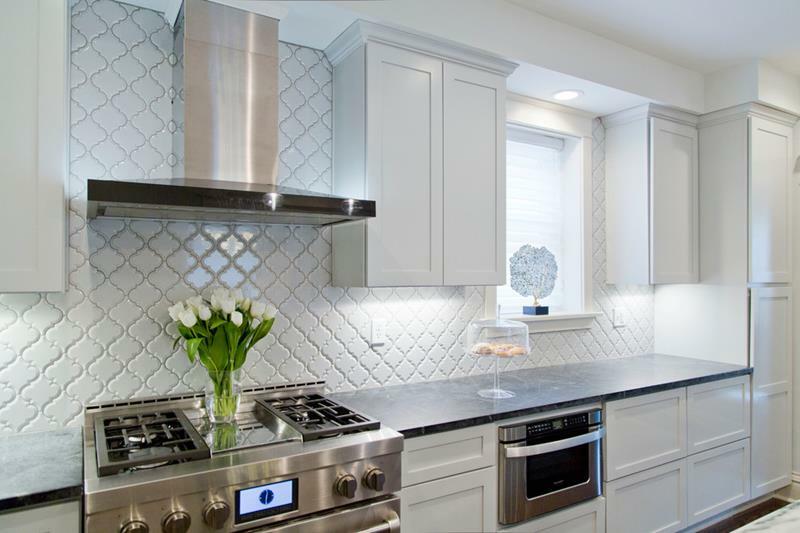 To go with the light cabinets and dark countertops, look at how well this backsplash complements both. Photo by Parker House Inc. There is a certain elegance about this room. 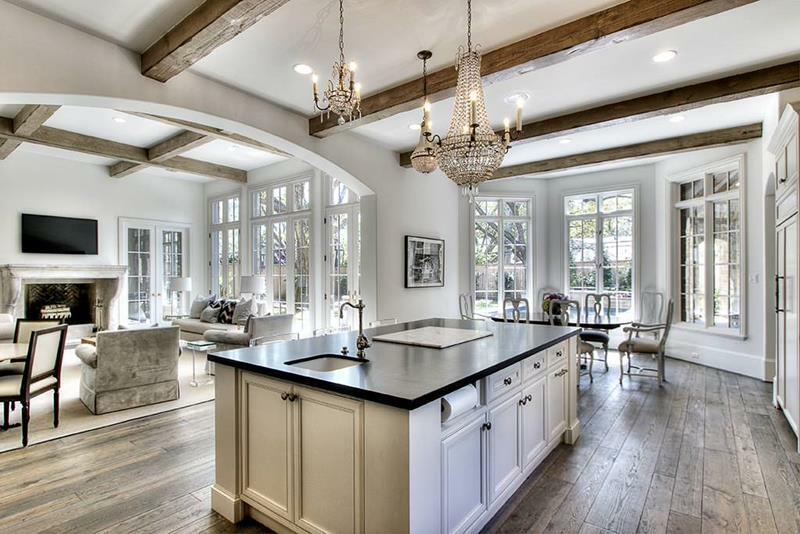 With the dark counters working so well with the hardwood, this style is amazing. 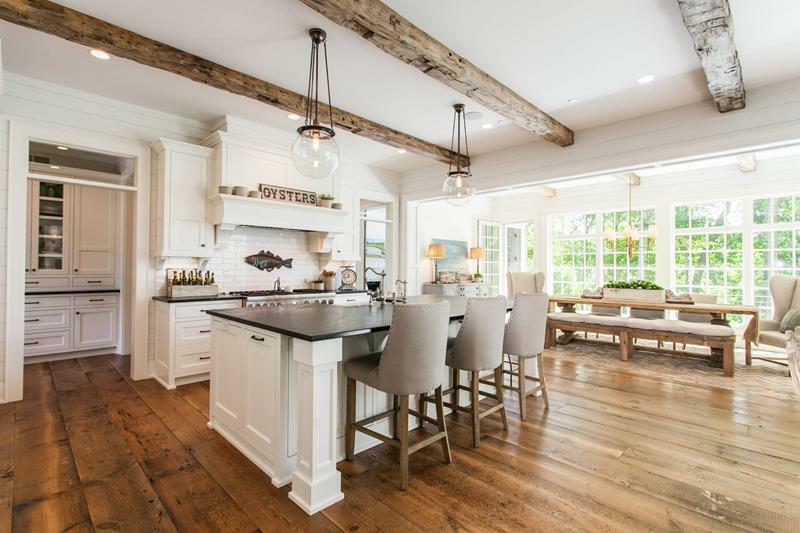 You can sense the traditional style at work in this room, from the textured hardwood floor to the choice of cabinets. 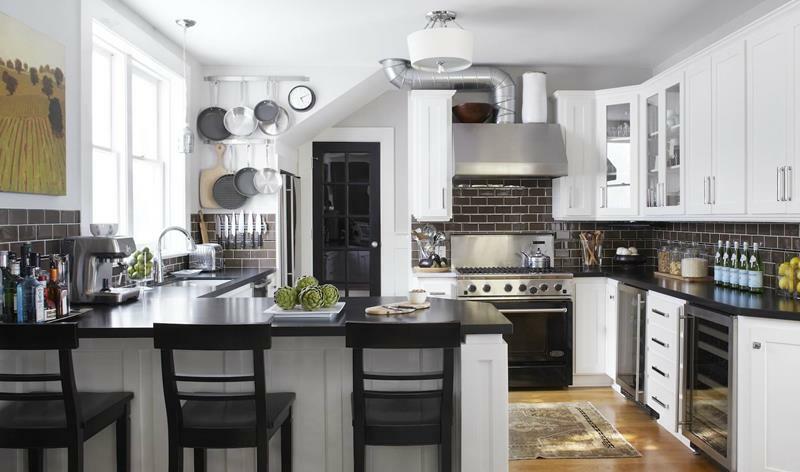 This kitchen is a modern upgrade to a traditional style, giving you wonderful contrasts between white and black. 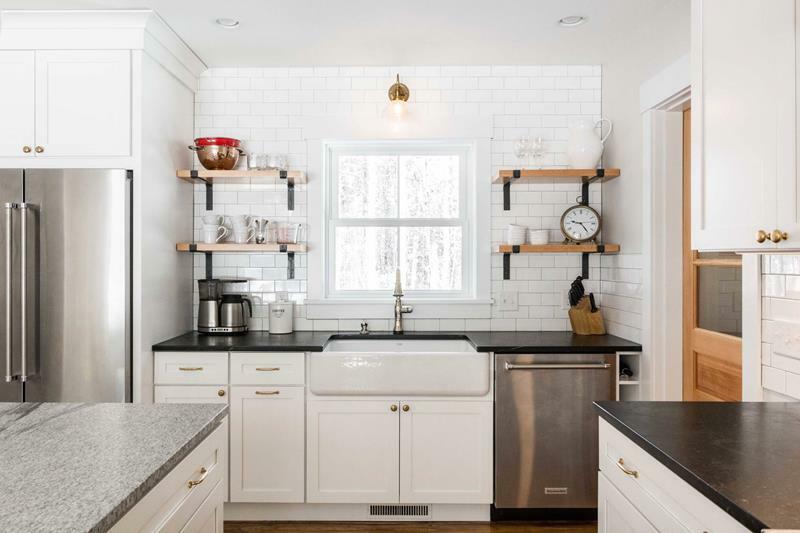 The subway tile backsplash is a great complement to the contrast between the countertops and white cabinets. Looking around this room, you can see a great use of multiple color tones all around, from the hardwood to the cabinets and counters. Welcome to a beautiful country style. With a contemporary flair, this space takes in the natural light to show off the design. With a beautiful traditional style hood very at the center, the contrasts between light and dark in this kitchen work really well. 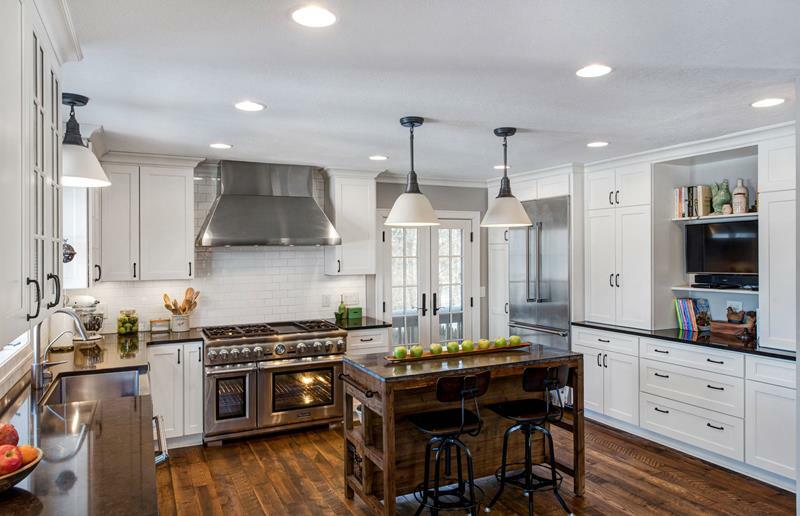 With modern stainless appliances, this kitchen has a charming country feel. Enjoy the blend of light and dark with hardwood. 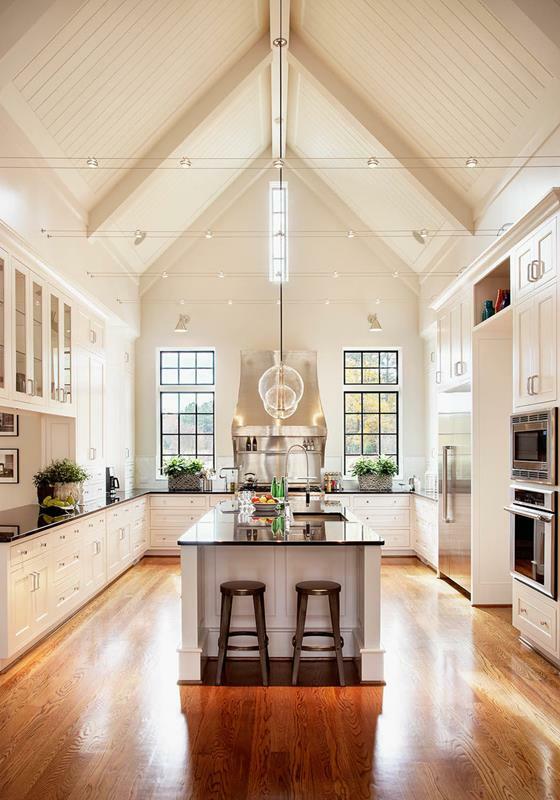 The natural light shines down from above on this great kitchen. With room to cook and dine, you will love being in this space. Stainless steel can be the perfect complement to a light and dark contrasting room. 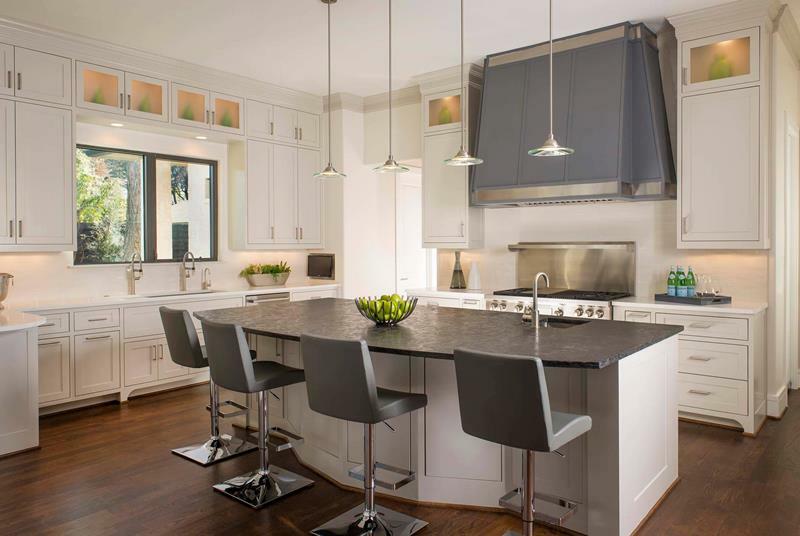 This kitchen would not stand out near as much without the darker countertops giving it a bold appearance. 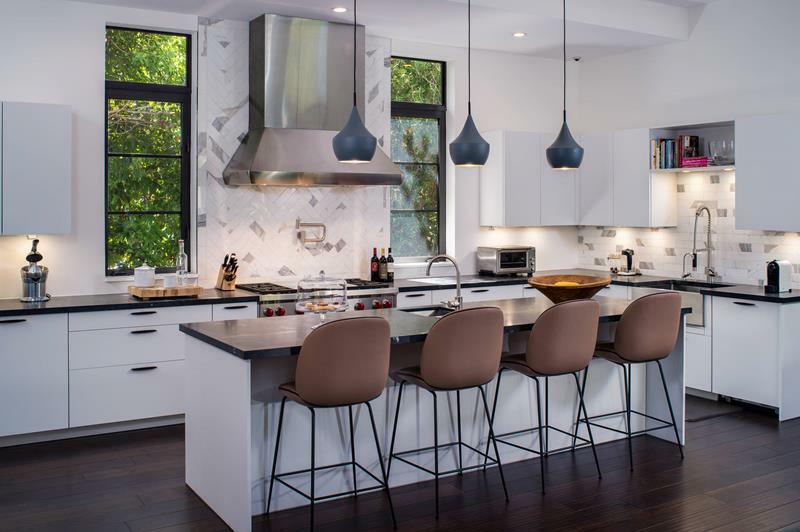 Take a step back in time with the design of this kitchen. 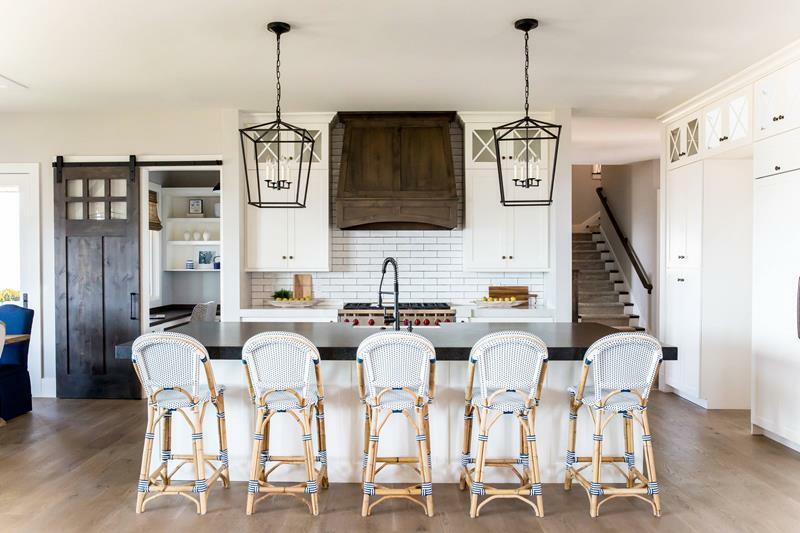 From the hardwood floors to the wood architecture, you will love this space. 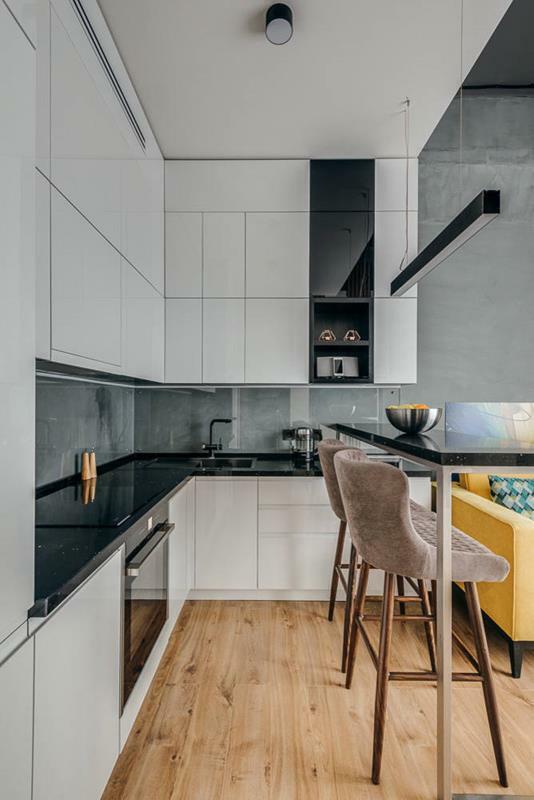 A bold and dark hardwood style works well with the combination of light and dark colors and the modern stainless steel. This open floor plan gives you plenty of options and it looks great. 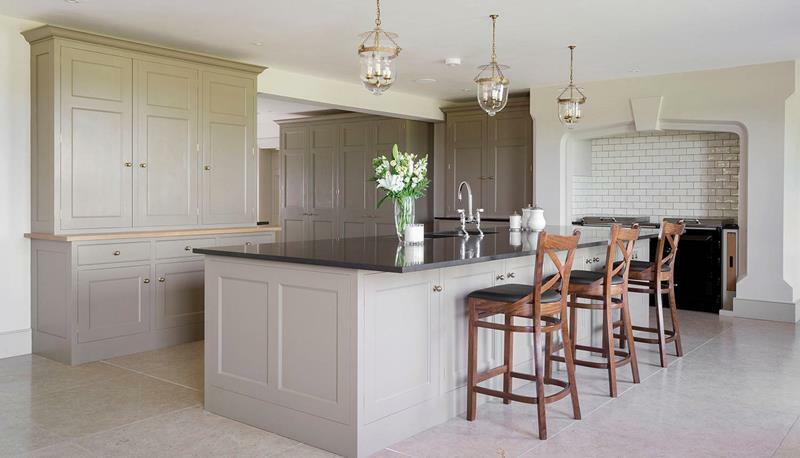 A modern take on a traditional style, the darker counters work so well here. 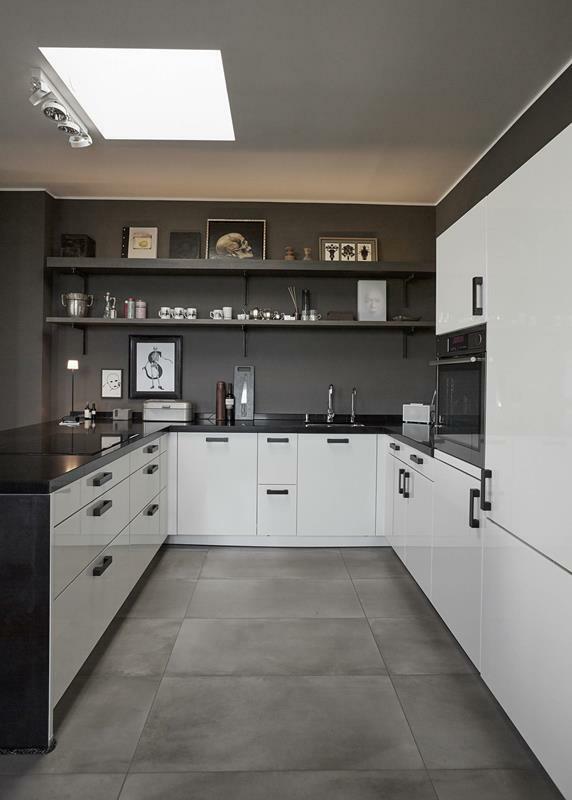 Like a European minimal design, this kitchen relies on a simple light and dark contrasts to make it wonderful. There is nothing complicated about this kitchen. 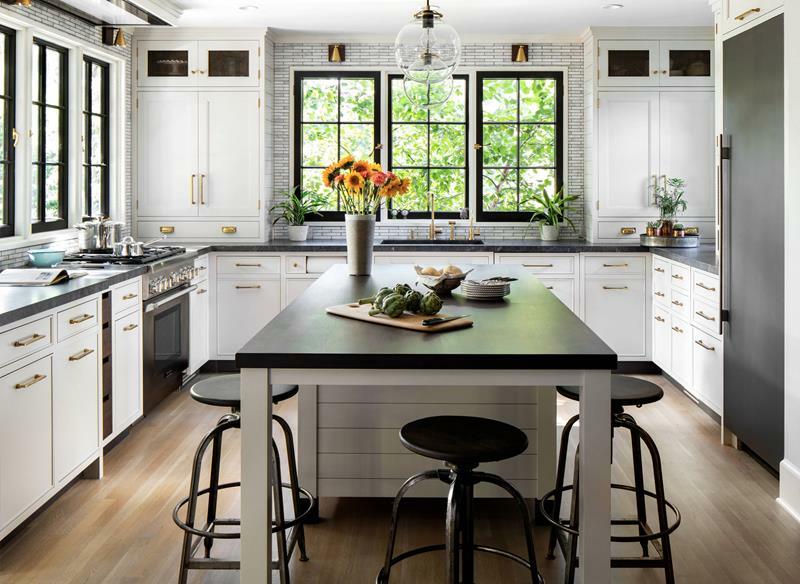 Light cabinets and dark counters are matched perfectly by the backsplash. 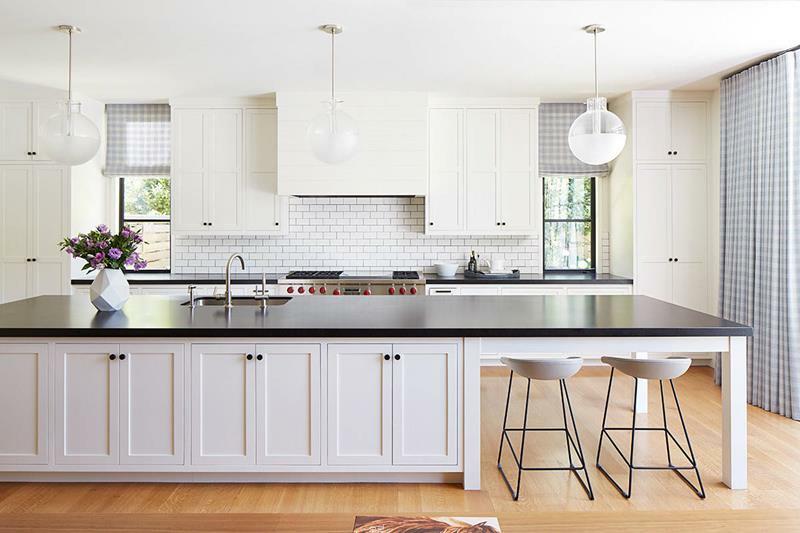 This kitchen makes itself half light and half dark and it works so well. The contrasts bring such great character to the space. 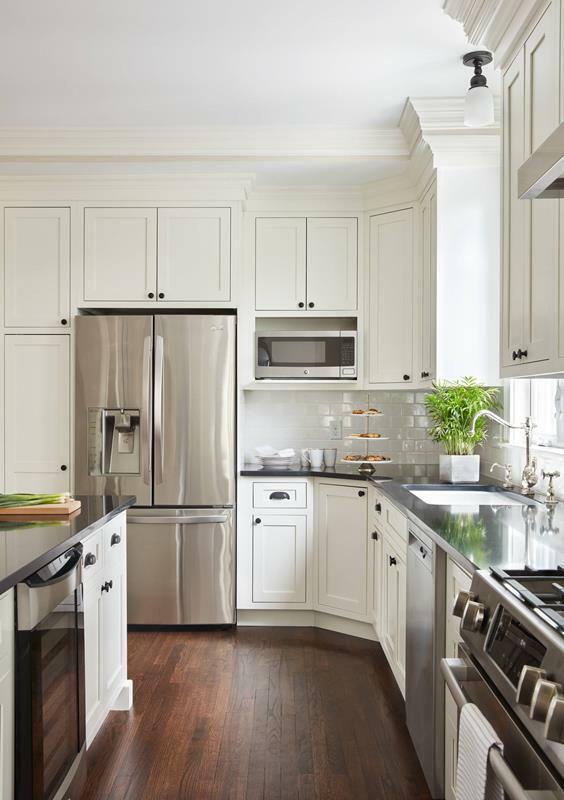 The modern stainless steel appliances work well with the traditional pairing in this kitchen. The dark hardwood floors complete the design. 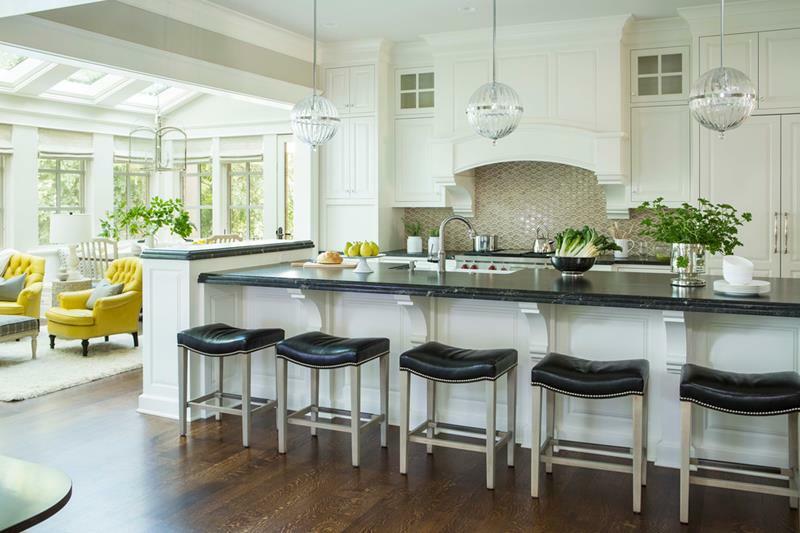 With a beautiful center island that has a dark counter, you can enjoy the balance of light and dark around the whole space. 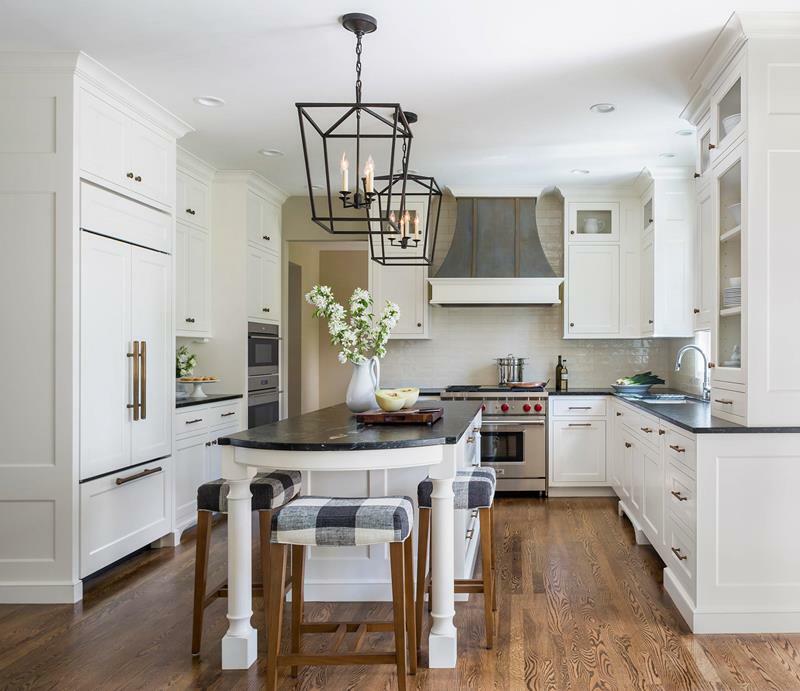 These cream colored cabinets look great when paired with the darker counter on the center island. 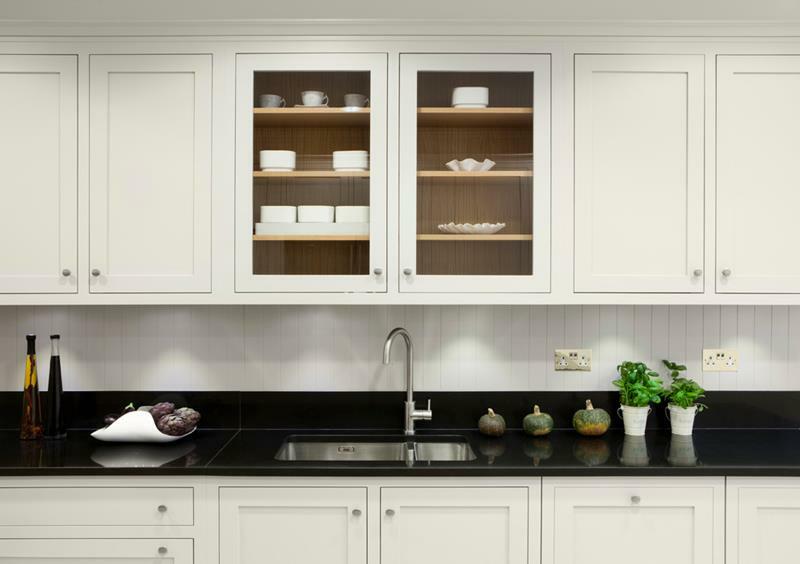 These simple light cabinets stand out so much more thanks to the hark countertop here. With easy decor, this space works really well. 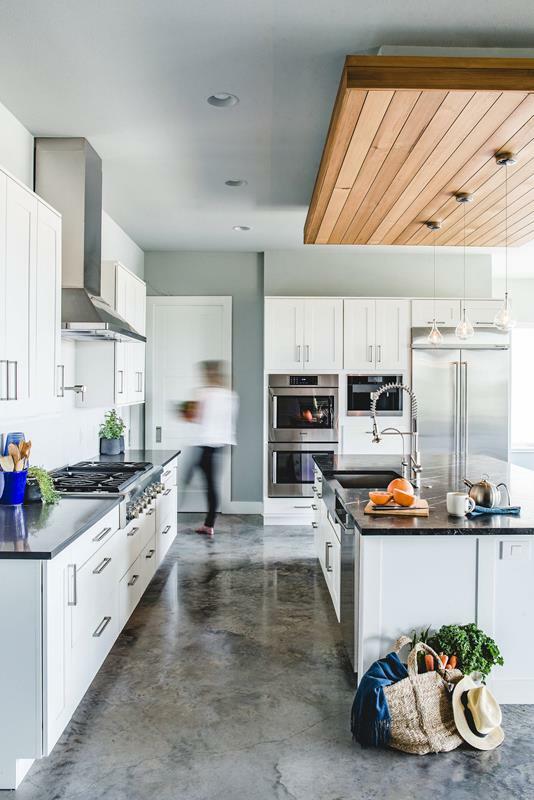 This whole kitchen opens to the outside and lets the natural light shine in on the beautiful contrasts. The backsplash here should not be underrated. 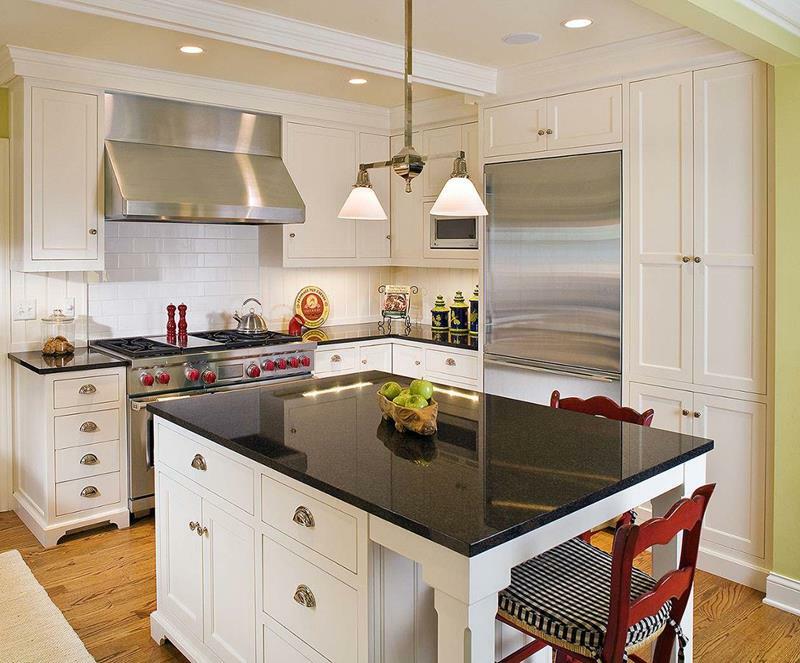 It works with the light cabinets to blend with the dark countertops. 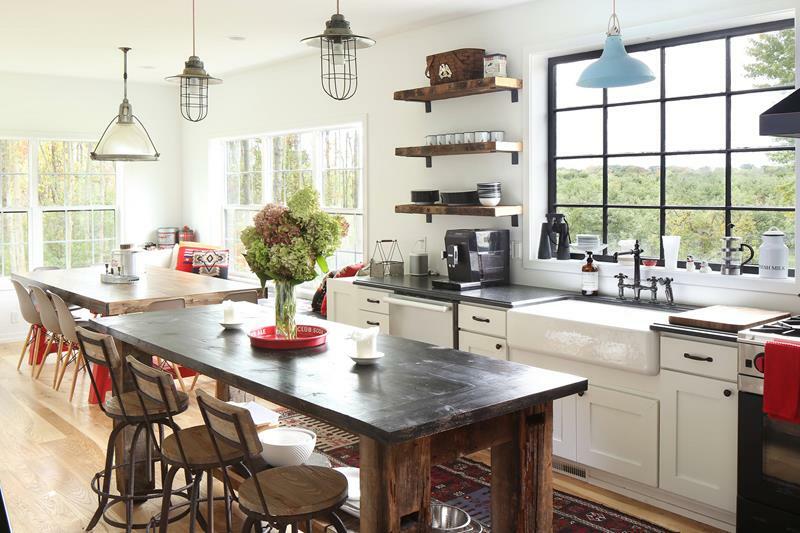 This kitchen is an eclectic mix of styles but it works so well. Cozy and comfortable, there is a charming country sense here. 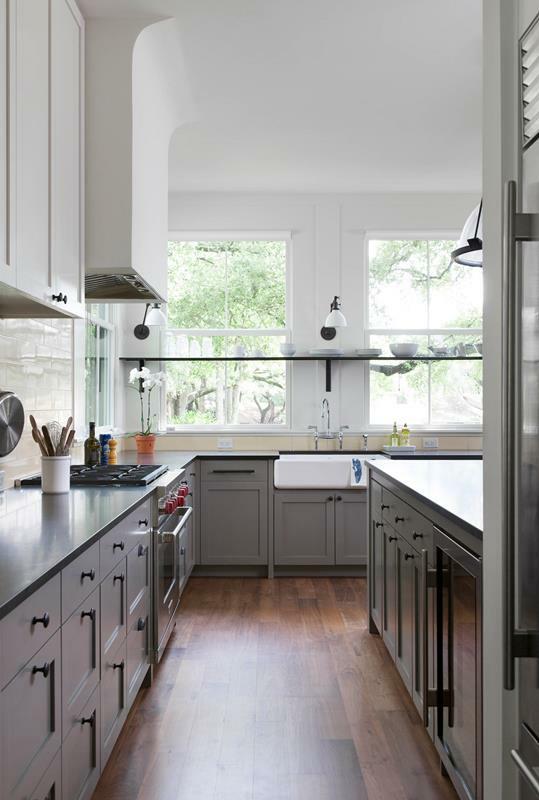 These gray toned cabinets are combined wonderfully with the dark countertops and hardwood floor. 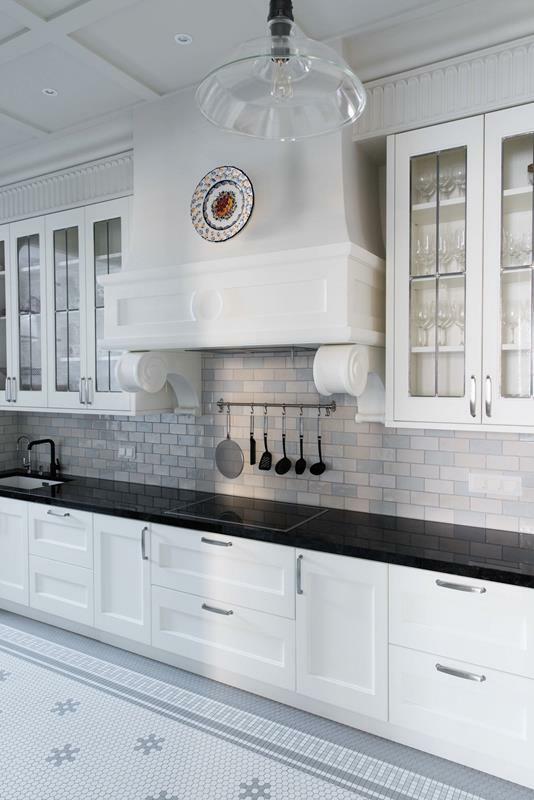 With a classic stove hood vent and a beautifully tiled floor, the dark countertops are such a great way to bring some contrast to this space. The darker backsplash is the perfect match for the countertops to make a contrast with the lighter cabinets. With the simple addition of a dark countertop for the center island, the whole dynamic of this room changes for the better. You can enjoy the designs of the tile around the backsplash because it really ties the cabinets and counters together well.